The fine Beaux Art cube lamp is a large heavy (two pounds!) frosted glass lamp etched (barely visible in picture, however, it is the same pattern that is shown on Item: #4317 - Beaux Art Cube Black) with various delicate patterns. 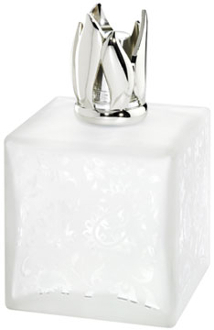 It is supplied in a Lampe Berger gift box which includes the lamp with flame top, Air Pur burner, funnel and instructions. Height: 6.5"